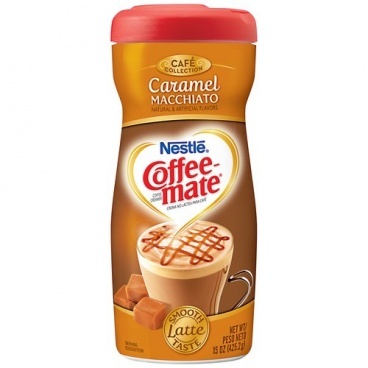 Nestle Coffee-Mate Caramel Macchiato Creamer is a cafe favorite that brings together the delicious warmth of caramel with an authentic smooth latte flavor that you'll never forget. 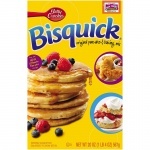 Sugar, Hydrogenated Vegetable Oil (Coconut and/or Palm Kernel and/or Soybean), Corn Syrup Solids, Less than 2% of the following; Sodium Caseinate (a Milk Derivative), Dipotassium Phosphate, Natural and Artificial Flavour, Mono- and Diglycerides, Sodium Aluminosilicate, Salt. 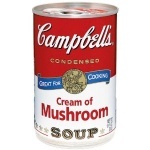 Contains a Milk Derivative. 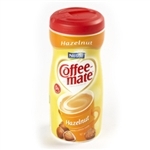 These flavours from Coffee Mate are not overpowering & a great addition to any cup of coffee. Definitely recommend.